It is quite late in the night but Rawalpindi’s China Market is still swarming with customers. An array of shops in narrow alleys selling imported Chinese goods next to the bustling Raja Bazaar, the market is stuffed with all kinds of merchandise, leaving little space for the tired customers to move around. “Be careful; you may break the vase. It is expensive,” a salesman in a crockery shop warns a little girl trying to feel the smooth surface of a vessel on display. At another shop, a woman is haggling over the price of what looks like a Versace handbag. She knows it is a copy – a good one though – and wants the shopkeeper to give her a hefty discount on it. “You are demanding a lot of money for a copy,” she politely reproaches the man at the counter who reminds her that it is a “first” copy and not just an “ordinary” bag. But then he agrees to give her a handsome discount. Able to buy the copies of branded luxury goods, which look as good as originals, and at prices that are within the shopping budgets of most middle-class households across Pakistan, customers in the country have much to thank traders in China Market for. “The best thing about these goods is that our middle-class people can now afford to live in style,” says Noshad Sheikh who runs a shop at China Market. “[Shopkeepers selling these goods have] brought international brands within the reach of local customers who, otherwise, would see those brands only in movies and on television shows,” he says. “Of course, I am talking about copies and not the original products,” he adds with a smile. How have ‘Made in China’ products become so easily available all over Pakistan and at prices that almost everyone can afford? The answers lie in a free trade agreement between China and Pakistan. Like most traders across Pakistan, he wonders if Pakistan’s retail sector could have blossomed like it has in the last decade or so if there were no China. “We wouldn’t have built sprawling markets at such a fast pace or created thousands of jobs [in the retail business] if we did not have these Chinese goods to sell,” says Ishaq. 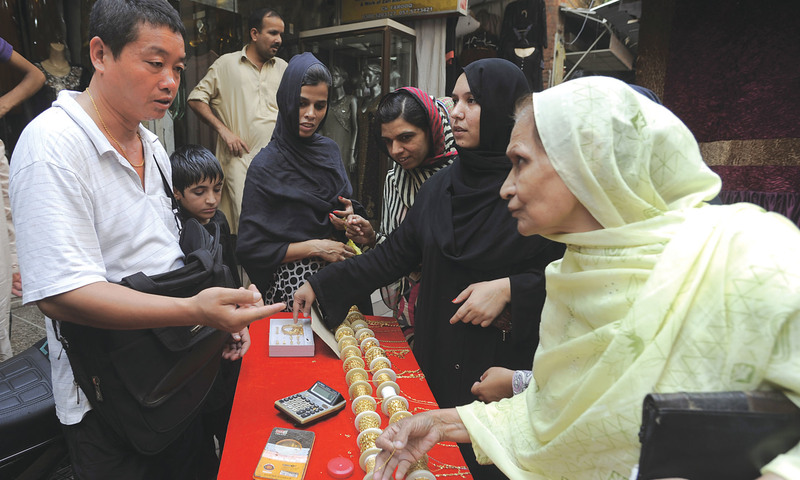 The new commercial culture introduced by China has not just facilitated the middle and low-income consumers in Pakistan, it has also helped small traders like Ishaq and Sheikh to explore options they could have only dreamt about without access to Chinese merchandise. Foreign travel was the prerogative of rich businessmen and exclusive domain of large-scale traders when business and trade destinations were mostly Western countries. China’s arrival on the scene has allowed even small-scale traders to go abroad and purchase their merchandise first-hand: visas are easy to get; expenses for travel and boarding and lodging are not as big as they would be for European or American destinations; and goods in demand back home are dirt cheap when purchased in bulk in China. “You can go to China every week, depending on your sales and cash flow,” says Mohammad Usman, who deals in mobile phone accessories at Lahore’s Liberty Market. Pakistani traders usually go to Yiwu city in Zhejiang province, about 300 kilometres to the south of Shanghai. The city, according to the United Nations, houses the “largest small commodity wholesale market in the world”. What has made all this possible? How can Pakistani traders go out and shop for Chinese imports with such ease? How have ‘Made in China’ products become so easily available all over Pakistan and at prices that almost everyone can afford? The answers lie in a free trade agreement (FTA) that came into effect between China and Pakistan in July 2007. At first glance, Peshawar’s Karkhano Bazaar would appear to be just another market in Pakistan where, in the first half of the day, the number of parked cars far exceeds the number of buyers inside the shops. Its distinctive features, however, emerge in the afternoon when the trickle of customers changes into a steady torrent. The bazaar is a cluster of several markets clumsily built on a stretch of land just a kilometre or so long — on Jamrud Road that leads out of Peshawar. Located just short of Khyber tribal area, the bazaar is, and has always been, about exploring the world, so to speak, at prices much cheaper than anywhere else in Pakistan. Its fabled tales comprise some of the most remarkable deals ever struck in the country. Everyone here swears by the old bazaar logic — the deeper you explore the more likely you are to strike the best bargain. That explains why the biggest deals are cut in small shops in the back alleys rather than at shiny stores on the main road. Karkhano Bazaar has long served as a gateway to Pakistan for anything that the world produced but was not allowed into the country through legal routes — from sturdy German appliances to no-frills-attached Soviet products. The latest goods to flood the bazaar come from China. The television set that you have just purchased, after a long and twisted tour of shops overflowing with merchandise, is sold to you as a Japanese product but, on closer scrutiny, may turn out to be made in China. The toys dangling out of the shopfronts are all Chinese manufactured as is so much else within your sight: cosmetics, toiletries, blankets, loose cloth, musical instruments, watches, shoes, crockery, ceramic tiles, vases and many other things. Durability is the word most commonly heard as prospective buyers sift through goods and haggle over prices. “Why doesn’t China send us products it sells to countries likes the United States?” is a common refrain. That Chinese goods do not last long is a universal complaint among Pakistanis who miss Western appliances well known for their robust structures. 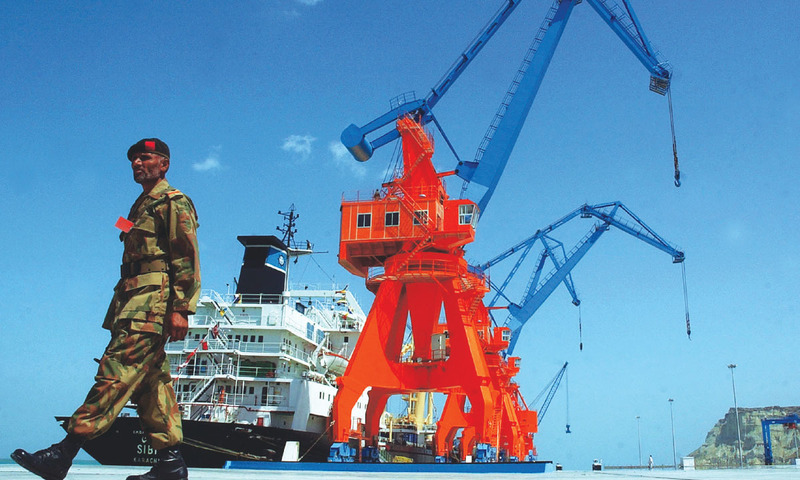 The size of commercial ties between China and Pakistan has been even smaller before the 2000s. Data released by the International Monetary Fund shows that Pak-China trade stood at just 18 million US dollars in 1960 and rose to a little over 100 million US dollars in 1977. The first major increase in bilateral trade came towards the end of the 1970s; by 1980, the two countries were trading goods worth 401 million US dollars. Analysts attribute this sluggish growth to the nature of Chinese economy rather than to any Pakistan-specific factors. This is how Ahmed Rashid Malik, a senior research fellow at the Institute of Strategic Studies Islamabad (ISSI) who regularly studies China’s political, economic and military relations with Pakistan, explains it: “China was a socialist, state-controlled economy until Deng Xiaoping took over the reins of the republic and started implementing economic reforms in 1978 to integrate his country with the global economy.” Also, he says, China started producing surplus for export at a mass level only in the 1980s when American, European and South East Asian companies first relocated their factories to China to take advantage of the extremely low cost of manufacturing there. Initially, the impact of these developments on Pak-China trade was not as big as that on China’s trade with Western countries. While Chinese goods had swarmed markets in the West by the early 2000s, the value of trade between Pakistan and China reached only 800 million US dollars in 2000. This certainly did not reflect the close ties between Islamabad and Beijing, particularly in diplomatic and military fields. Besides China’s late entry into the international market, several other factors have been responsible for the slow growth of its trade with Pakistan. One major reason was Pakistan’s policy of linking its economy closely with the US, Europe and other open market economies rather than with socialist China, explains Shahzad Azam Khan, a Lahore-based businessman who has strong connections with Chinese manufacturers. “Although Pakistani leadership, especially Benazir Bhutto, repeatedly pledged to adopt a “Look East” policy for economic growth in the middle of the 1990s, no one took steps to actually boost economic cooperation with China,” he says. While Chinese goods had swarmed markets in the West by the early 2000s, the value of trade between Pakistan and China reached only 800 million US dollars in 2000. The wish to deepen economic ties with China, therefore, mostly remained confined to political rhetoric and memorandums of understanding. Pakistani businessmen continued to prefer producing for and trading with the Western markets because of the ease of doing business in the markets they knew well and because of Pakistan’s historical and political linkages with Europe and the US. The Chinese, too, did not show much enthusiasm for increasing trade links with Pakistan because they were focused on wealthy consumers in the bigger and high-growth economies. “A slow-growing economy like Pakistan, which produced little or nothing needed by the Chinese manufacturers and consumers, didn’t offer much to Chinese businesses with large economies of scale. The size of Pakistani consumer market was also not big enough to attract Chinese manufacturers who produce and export at a mass level,” stresses businessman Khan. Given these factors, influx of Chinese goods into the Pakistani market during the last decade and a half has been spectacular. From a few hundred million US dollars in 2000, the value of bilateral trade grew to around 16 billion US dollars last year — though tilted heavily in China’s favour. Even before the two countries signed the FTA in July 2007, the value of their bilateral trade had already increased to almost 7 billion US dollars. After the FTA became operational, that value surged further and reached 14 billion US dollars in 2013, making China Pakistan’s biggest trade partner. 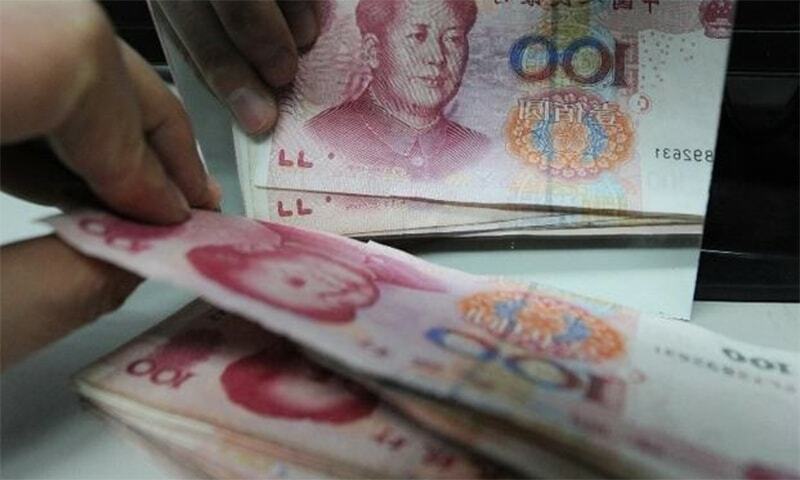 The two governments expect the value of bilateral trade to reach 20 billion US dollars by 2020 but analysts like Malik say it could rise faster than “we can now imagine”. Low trade volume in the 1980s and 1990s, however, did not mean that Pakistanis had no access to Chinese products all those years. 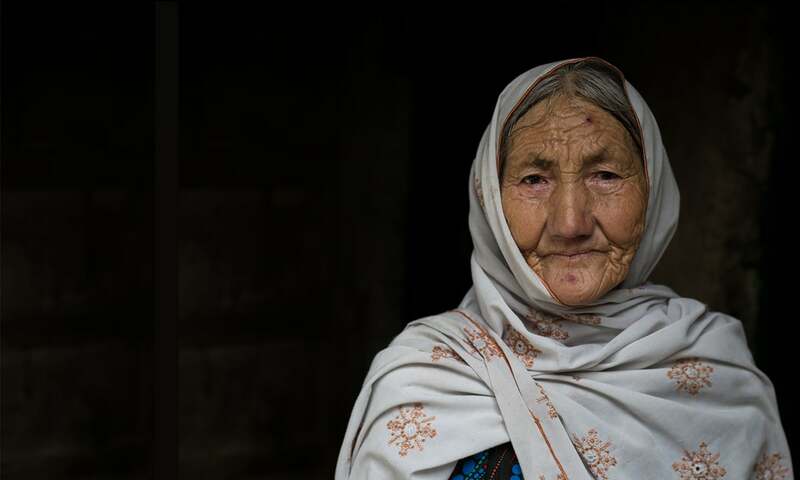 Initially, the goods were brought in smaller quantities by Muslims living in the westernmost Chinese province bordering Pakistan, Xinjiang, when they were allowed by their government to travel through Pakistan for performing Hajj in the 1980s. 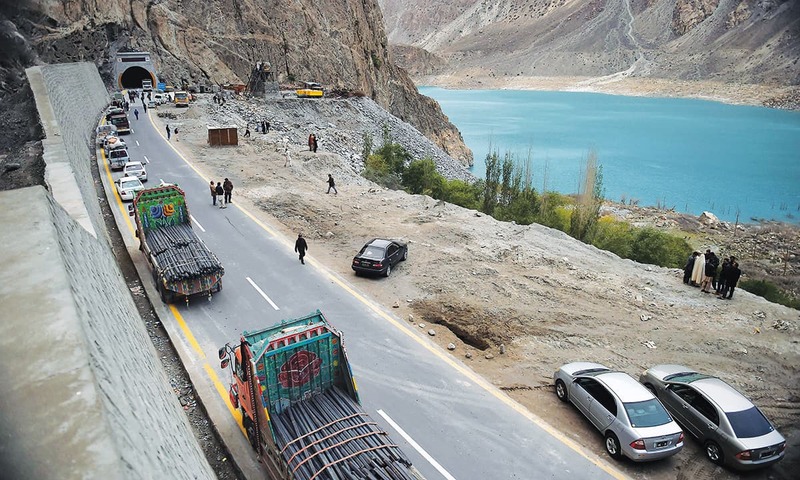 Later, Chinese consumer goods started pouring into Pakistan via the Afghan Transit Trade route, through indirect imports routed from Dubai or on trucks passing through the Khunjerab Pass that links Pakistan’s northern areas with Xinjiang. These routes continued to supply Chinese goods to markets, such as those at Karkhano Bazaar, well into the 2000s. Prominent businessmen in Lahore claim they had to raise alarm about the negative impacts of such smuggled goods on Pakistani trade and industry before the government took note. One of the people at the forefront of those protestations was Anjum Nisar who runs chemical manufacturing, leather and other businesses in Lahore. Some of his enterprises were under serious threat from the smuggled Chinese goods. “It was only after Pakistani businessmen started making noise about the smuggling of Chinese goods that the government secured its borders,” he says. Many business people in Pakistan may now be ruing the result of those efforts. Instead of providing the protection they were seeking, the tightening of borders increased the volume of Chinese goods entering Pakistan — this time through legal and official channels. “[Official] bilateral trade thus began to increase quickly in the early 2000s,” says Nisar. The implementation of FTA a few years later further reduced the need for traditional smuggling routes. “It became much more convenient and cost-effective for traders in Punjab to import directly from China than to buy smuggled Chinese stuff from Peshawar,” says Ijaz A Mumtaz, president of the Lahore Chamber of Commerce and Industry (LCCI). “The days when [Afghan] transit route was the biggest source for supplying Chinese goods in Pakistan’s markets were over,” he adds. Karkhano Bazaar, therefore, lost its monopoly over the import of cheap Chinese goods and direct trade through the port of Karachi became the most important source of bringing China’s merchandise into Pakistan. The FTA has brought down import taxes on both sides of the Pak-China border and removed many non-tax barriers which, in the past, disallowed bilateral trade in certain goods and commodities. This has led to a deluge: from high-end electronics to low-end toys, from replicas of art pieces to handbags, from sanitaryware to shoes and sunglasses, from cell phone accessories to kitchenware, Chinese consumer goods are ubiquitous in Pakistani markets. Large malls and markets ‘specialising’ in Chinese products have come up in almost every big city in the country; Rawalpindi’s China Market being just one of them. But it is perhaps the busiest places to buy everything Chinese. “Now the customers do not have to travel all the way from Lahore or Faisalabad to Peshawar to buy ‘imported’ Chinese good to decorate their homes or shop for their daughters’ dowries,” says Sheikh, the China Market trader. A Karachi-based tile manufacturer, who does not want to be mentioned by name, believes Chinese tile manufacturers and their Pakistani importers are doing something unlawful to ensure that the prices of their merchandise continue to drop. All cost indicators, such as wages and transportation charges, are going up in China but surprisingly the import trade price of Chinese tiles is still going down in Pakistan, he says. “The import trade price of Chinese tiles came down from 4.57 US dollars per square metre in 2011 to 2.51 US dollars per square metre in 2013.” How has that become possible is a mystery for trade authorities in Pakistan to resolve. Local tile manufacturers, in the meanwhile, chafe under its negative impact. 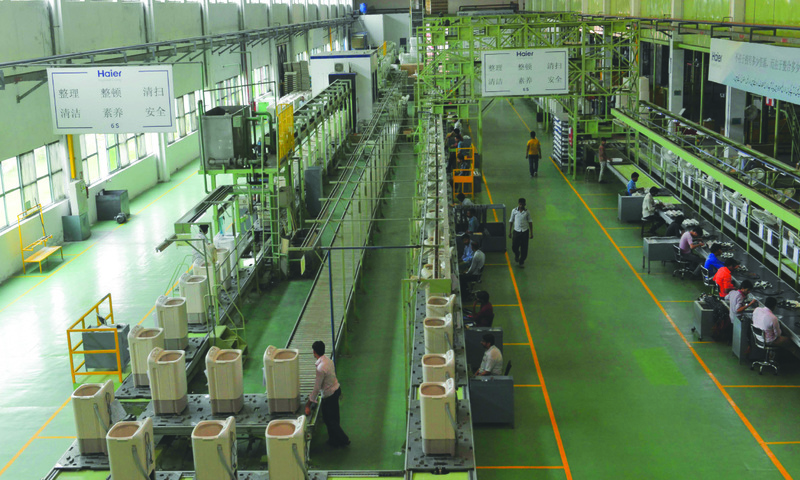 “The 40-billion-rupee local tile manufacturing industry is suffering losses and teetering on the brink of closure,” the manufacturer claims. Nobody, it seems, took such threats to the local industry into consideration while negotiating the FTA with China. Trade officials in Islamabad, instead, expected the agreement to help Pakistani manufacturers gain access to the ever-expanding Chinese market — imagine the lure of more than one billion consumers living right next door to you. And the agreement did increase Pakistan’s exports to China – at least initially – from one billion US dollars in 2008 to over three billion US dollars in the next five years. Yet, in spite of this rather extraordinary growth, the share of Pakistani exports in China’s market remains tiny. The agreement has also reduced government revenue earned from the import of consumer goods from China without corresponding benefits in export earning, says a Pakistani diplomat who has conducted a research study on the FTA’s impacts on Pakistani industry and exporters. Pakistan hasn’t succeeded in taking advantage of the concessions offered by China under the FTA primarily because of high cost of domestic production, energy shortages and the fact that products made by Pakistan’s competitors from East Asian countries invariably attract zero per cent tariff in China, he explains. As a result, Pakistan has so far utilised only five per cent of the FTA concessions; China has utilised 60 per cent of them. The expected direct Chinese investments in the post-FTA period have also not materialised — not at least so far. Apart from China Mobile that operates in Pakistan as Zong, no other Chinese company has made any significant investment in Pakistan since 2007. Beijing also went back on its commitment to give tariff concessions to Pakistani textiles and fish exports in the first five years of the agreement’s operation. Trade officials in Islamabad, instead, expected the agreement to help Pakistani manufacturers gain access to the ever-expanding Chinese market. Then there are ingenious Pakistani importers. They have found ways to bring down even the concessionary import taxes levied under the FTA. They heavily misreport the actual worth of their imports from China (called under-invoicing in tax parlance) and thereby have miniscule import taxes levied on their merchandise. A recent study by Pakistan Business Council shows that Pakistani importers under-invoiced their imports from China to the tune of 3.42 billion US dollars in 2013. For that year, China claims to have exported goods worth 11.02 billion US dollars to Pakistan whereas Pakistani authorities report to have received Chinese imports worth just 7.6 billion US dollars. Major discrepancies in the data collected by the two governments were found in the trade of electronics and electrical equipment, machinery, man-made filaments and staple fibres, iron and steel, organic chemicals, plastics, fertilizers and rubber. The effects of under-invoicing are dire for many industries in Pakistan — tyre manufacturers being among the most affected. “We could be a 25-billion rupees company – almost triple our present size – in a matter of very short time, if the government pulls the plug on under-invoiced imports of tyres from China,” says an executive of the 50-year-old General Tyre Company. The data seems to prove him right: almost 55 per cent of all the tyres being imported into Pakistan come from China; they are under-invoiced almost by 40 per cent. Faced with such desperate situations, some businesses have adopted a smart survival strategy: if you can’t beat Chinese manufacturers, join them. They have shifted their production to China to reduce manufacturing costs. “In 2003, we decided to make China a part of our footwear supply chain,” says Omar Saeed, chief executive officer of Servis Industries, one of the leading shoe-manufacturers in Pakistan. The decision was necessitated by the fact that China dominates cheap non-leather footwear categories due to its low-cost mass production. “The cost of production in China is 20 per cent lower than ours,” says Saeed. Not just Servis Industries but almost every notable footwear manufacturer in Pakistan has shifted its manufacturing to China and not just due to lowerf production costs. In Pakistan, you have to procure parts of a product from several vendors; in China, you can get all those parts from one place, Saeed says. While this strategy has helped individual Pakistani businesses to not just survive the Chinese onslaught but thrive in collaboration with it, its impacts elsewhere in the economy have been devastating. In shoe-manufacturing alone, according to Saeed’s estimate, at least 20,000 jobs have shifted from Pakistan to China. Businessmen also complain the government in Islamabad sometimes gives Chinese investors special project-specific concessions with negative consequences for local manufacturing. Kamal Amjad Mian, a director at Fast Cables, for instance, points out that the 1,000 megawatt solar power project in Bahawalpur requires several hundred kilometres of cable which could have created an opportunity of a lifetime for local cable manufacturers. “It would have been cheap and convenient for Chinese investors to place orders from Pakistani vendors, given that cable imports from China attract sizeable import taxes,” he tells the Herald. But the government waived taxes on cable imports from China specifically for the solar power project on the ground that “local manufacturers would have taken longer to meet the demand”. Syed Nabeel Hashmi manufactures gardening accessories – such as shovels, baskets, tubs – from plastic. Only a few years ago, his manufacturing unit in Lahore was facing a bleak future. “China had almost captured the plastic market in Pakistan,” he says. Instead of giving into under-invoiced imports from China, however, he decided to compete. He cut production costs and brought prices down to a level which products imported from China could not afford. “Today you will not find Chinese gardening accessories in the local market,” he says proudly. Some others have taken another route. Instead of competing with them, they have convinced Chinese manufacturers to set up their production facilities in Pakistan. Shah Faisal Afridi is one of the pioneers of this trend. As the director of Haier Pakistan, a local subsidiary of the Haier Group, a Chinese firm specialising in consumer electronics and home appliances, he also oversees the 300-acre Haier-Ruba Economic Zone near Raiwind in Lahore. A joint venture of Haier Group of China and Ruba Group of Pakistan, the zone was inaugurated by the then Chinese President Hu Jintao in November 2006. It is one of the eight Beijing-recognised economic zones outside China where Chinese firms are encouraged to set up their productions facilities. 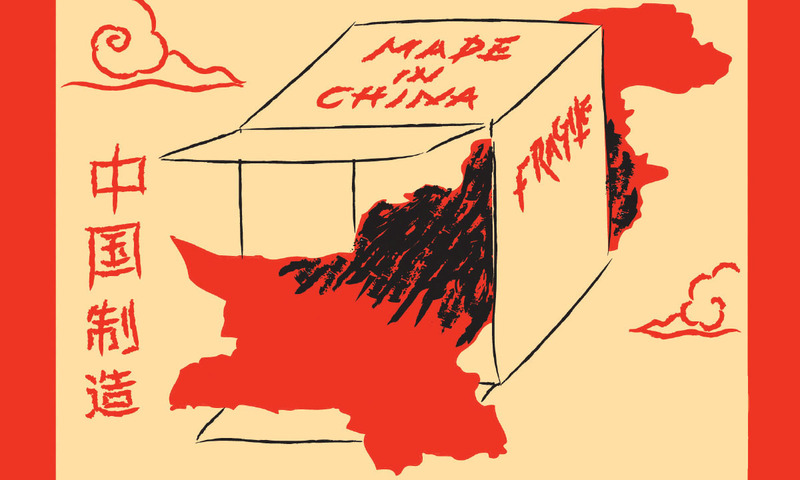 Slowing economic growth, rising production costs and scarcity of labour in China are forcing many Chinese companies to relocate their factories to other countries with abundant cheap labour. Afridi has been working in partnership with Chinese manufacturers since the early 2000s. His business relations with several Chinese firms, such as Haier, have given him the confidence to plan new joint ventures with them. “By next year, we plan to bring a Chinese car-maker into Pakistan besides starting local production of mobile phone handsets [with Chinese help],” he says. Unlike many businessmen who complain that Pakistani leaders and government officials always exhibit an obsequious attitude while dealing with the Chinese and never protect their own country’s economic and commercial interests, Afridi believes the opposite. 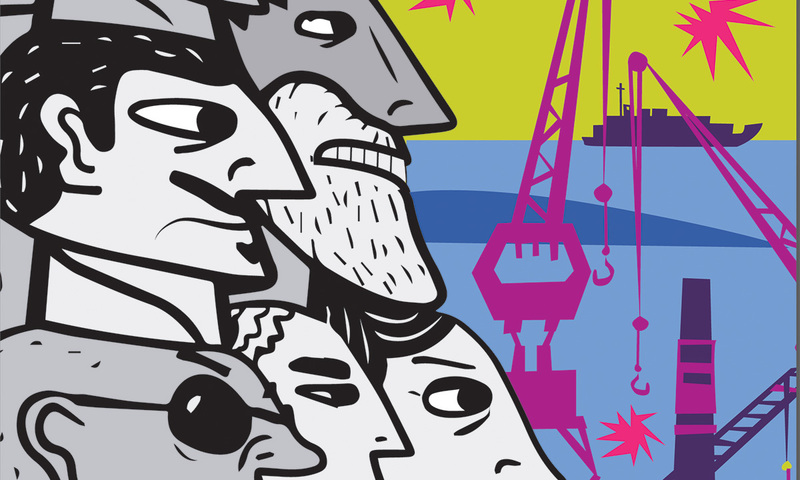 He argues that now is the best time to woo Chinese investors, through whatever it takes. Slowing economic growth, rising production costs and scarcity of labour in China are forcing many Chinese companies to relocate their factories to other countries with abundant cheap labour, he explains and adds that Pakistan is already one of the prospective destinations for such relocation. “The Chinese are seriously interested in relocating many of their industries to Pakistan particularly after the recent progress on the CPEC. [These companies] will create millions of jobs here,” Afridi says. To make those companies shift their production to Pakistan, he suggests, Pakistani authorities need to provide them more concessions, not less. Afridi also claims that Chinese firms treat Pakistanis like they treat no one else. “They have a special place for Pakistan in their heart,” he says and, as proof, cites his own experience of working with the Haier Group. “They are very liberal in transferring technology to us” unlike most Western companies which are quite stingy on this count. Not that this technology transfer has been a free gift. In return, Haier Group has been making massive inroads into the Pakistani market for electronics and electrical appliances. As things stand today, it has already become one the top three home appliances brands in Pakistan. In a popular Beijing market early last January, a young salesgirl hugs a Pakistani tourist no sooner than he enters her shop along with his three other countrymen. “You are from Pakistan? You, my friend,” she says exuberantly as the tourists move around decoding price tags, converting renminbi into rupees. “You get special discount today ... on anything you buy from my shop,” she goes on. As soon as these reassuring words come out of her mouth, the Pakistanis go on a buying spree, transferring almost everything on the shelves into their shopping baskets. “I told you the Chinese love us,” one of them reminds the others. This illusion does not last long. Soon they find out that the “special discount” promised to them is, after all, not so special and, indeed, is available to all customers, regardless of places of their origin. “Oh, I promised that I’ll give you a special discount but you want these things for free,” the salesgirl smiles as they try, meekly, to haggle with her and remind her of her “love” for Pakistani “friends”. Once back in their hotel rooms, they compare prices and find out that they would have spent far less money if they had purchased the same goods from Lahore. 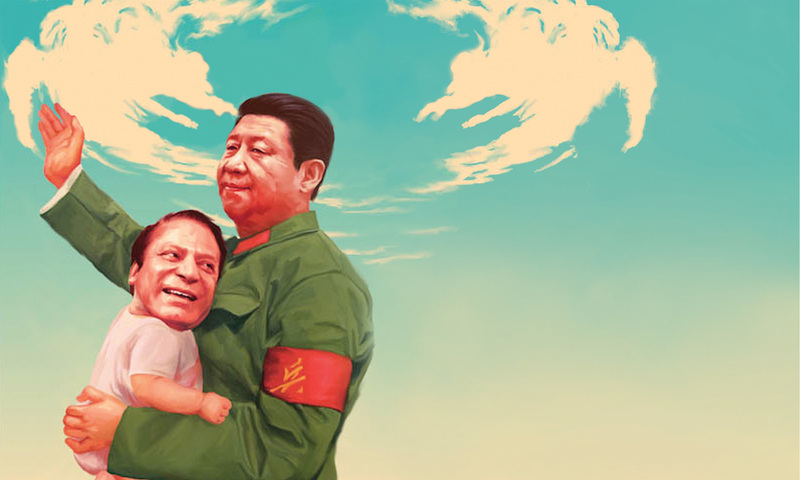 Like many love affairs, the one between China and Pakistan is made of unrealistic expectations – mostly among Pakistanis – and a hard-nosed pursuit of strategic goals and political and economic objective — mostly by the Chinese. The language of this love affair, however, is such that it raises more expectations than it encourages a sober analysis of the ground realities — “higher than the Himalayas, deeper than the sea and sweeter than honey” are the most common phrases to describe this more than six-decade-old “all-weather friendship”. Andrew Small has been looking at this love affair as a fellow with the Asia programme at the German Marshall Fund of the United States for years. He has recently published a well-received book, The China-Pakistan Axis: Asia’s New Geopolitics, and sees no problem with the hyperbolic language that the leaders and opinion makers in both China and Pakistan employ to describe their ties. “The language … is actually quite accurate,” he tells the Herald. Explaining the nature of Pak-China relations, he says: “It is not an alliance, insofar as the two sides don’t have formal defence treaty commitments.” It is a “relationship of trust” that has been “tested out” over several decades. “[It] is closer in some important aspects than most alliances,” Small adds. He also argues the relationship between the two countries has never been a one-sided affair — with Pakistan always asking for something and China always giving that. “It would have been impossible to maintain the relationship if it were entirely one-sided.” Pakistan, he says, has tended to benefit more, mainly because “China has long had the economic, military, diplomatic and technological wherewithal” to extend certain benefits to Pakistan that Islamabad cannot readily reciprocate. “But that hasn’t been out of a spirit of goodwill.” The benefits accruing to Pakistan, says Small, have “corresponded very closely to China’s strategic interests in the region and beyond”. He gives the example of CPEC to make his point. Why the economic corridor “looks so promising” at the moment is that its “benefits accrue so clearly to both sides”. At other times, he argues, “the impetus for economic projects of this nature has only really been coming from Pakistan, but now the political, commercial and strategic rationale for China is very clear, too.” The most basic constituent of that rationale is the realisation in Beijing that Pakistan “is poised to play an important role in China’s transition from a regional, East Asian power to a global one”. The corridor is so important for China, both from strategic and commercial angles, that Beijing is willing to provide soft loans to Pakistan for its completion, says Dr Zafaruddin Mahmood, who worked as a banker for the better part of his life and has served as Pakistan’s consul general in Shanghai in 2009. Another important aspect of Chinese investment in CPEC is that a significant portion of it will go into the social sector — a first as far as the history of China’s spending in Pakistan is concerned. Some of the money will go into projects such as the construction of a hospital in Gwadar and establishment of vocational training institutes, says Mahmood who divides his time between China and Pakistan and works as a consultant for both Pakistani and Chinese firms. Pakistan has already done quite a bit to earn this Chinese generosity. It, indeed, was the first Muslim state and the third non-communist nation to recognise the People’s Republic of China in 1950 and establish diplomatic relations with Beijing the next year. Since then, Pakistan has been backing China at international forums very regularly. “Pakistan has supported China on every diplomatic issue involving the latter whether it was the economic blockade that it faced on the Taiwan issue or its claim for a permanent seat at the United Nations Security Council. We have stood by Beijing in every difficult moment it has faced,” says a foreign ministry official in Islamabad. He does not want to be named because he is not authorised to issue public statements on foreign policy. And not just that. Islamabad played a major role in bringing China and the US closer by facilitating President Richard Nixon’s secret visit to Beijing in 1972. That visit helped the Communist Party regime in Beijing to get the official United Nations recognition. “President Xi Jinping acknowledged all this in his speech to parliament during his recent Islamabad visit,” says the anonymous official. Masood Khan, a soft-spoken, bespectacled former diplomat who now heads ISSI, an official think tank that studies diplomatic, strategic and military affairs, seconds the official point of view. “China has helped Pakistan immensely in all spheres — strategic, economic and diplomatic,” he says, though never as a favour. In an unemotional tone perfected during years of working as the foreign office spokesman, he goes on to argue that the military and technological assistance provided to Pakistan by China demonstrates the Chinese leadership’s gratitude for diplomatic support that Islamabad has provided to Beijing at “every critical point” at international platforms. Mushahid Hussain Sayed, who has had an eventful career as an academic-turned-journalist-turned-minister, readily endorses these official and semi-official narratives but adds to them a historical and regional perspective. He has been in public life in various capacities since the early 1980s – as a newspaper editor, as information minister, as the secretary general of the then ruling Pakistan Muslim League Quaid-e-Azam between 2002 and 2007 and, currently, as a member of the Senate. He now wears an additional hat — swathed in the dark greens and blood reds of Pak-China friendship: in 2009 he set up the Pakistan China Institute (PCI), a think tank devoted to promoting people-to-people diplomacy and relationship between the two countries. Recently, he has also been involved in track-II tripartite diplomacy involving Pakistan, China and Afghanistan. Possessing, as he does, such first-hand grounding in current affairs, Sayed does not take a narrow view of Pak-China relations. For him, these did not spring out of nowhere in 1950. Relations between the regions that constitute today’s Pakistan and the People’s Republic of China, he says, “have a long history of friendly exchanges”. This started 2,500 years ago when Taxila was the centre of Buddhism. “The world’s first Buddhist university in Taxila attracted Chinese scholars and monks, who carried back to their country techniques for creating Buddha’s images, carvings and sculpture. Around the same time, silk and tea from China reached present-day Pakistan via the Silk Route, which eventually became a bridge between China and the West,” says Sayed. As Small points out, it was, however, India which gave an early impetus to Pak-China relationship and in many ways provided the strategic glue that has held it together. The two counties first came close to each other in the wake of the 1962 India-China war. It was then that Pakistan started looking towards China as a “counterweight” to India. Islamabad quickly settled its border dispute with Beijing and signed an agreement to establish bilateral economic cooperation. “When Washington provided military assistance to India against China, it annoyed Pakistan’s leadership. It was at that point that General Ayub Khan and [his foreign minister] Zulfikar Ali Bhutto decided to move towards China,” says Sayed. “Pakistan’s war with India in 1965 was another major turning point in our relations with China. While Americans imposed military sanctions against Pakistan, Beijing extended full diplomatic and military assistance to Islamabad. That made it abundantly clear as to who was our true friend,” he adds. A recent study by Pakistan Business Council shows that Pakistani importers under-invoiced their imports from China to the tune of 3.42 billion US dollars in 2013. 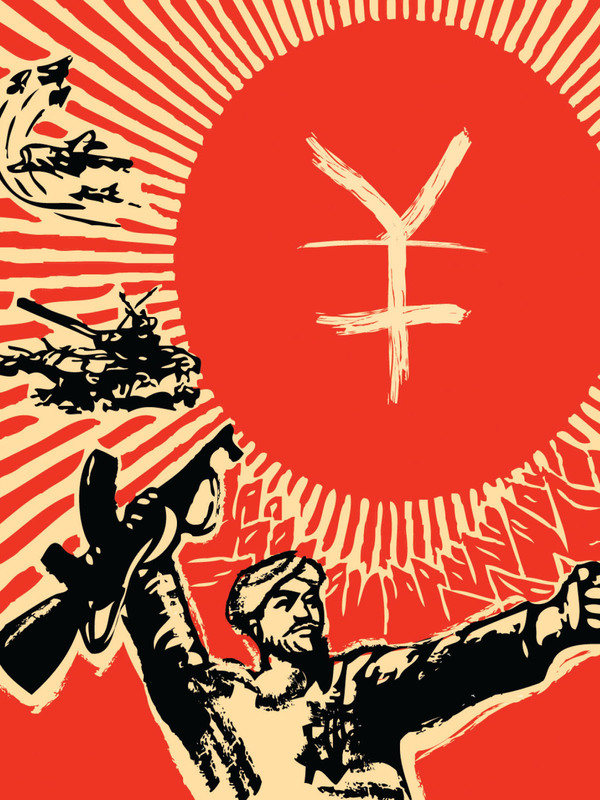 At the same time, Chinese influence led to a split in the leftist political parties which, till then, mostly looked towards the Soviet Union for political inspiration and ideological guidance. The National Awami Party and leftist student organisation, National Student Federation, both split down the middle among pro-China and pro-Soviet Union factions. “This divide was apparent at the 1970 peasant conference in Toba Tek Singh where the participants cheered pro-China leader Maulana Abdul Hamid Bhashani more than they applauded pro-Soviet Union Faiz Ahmed Faiz, though both shared the same stage,” says Ahmed. Chinese presence in Pakistani political culture reached its zenith in the 1970s. Mao caps and Mao coats that Zulfikar Ali Bhutto appropriated became the political and fashion statements of the day. At least on one occasion, the entire Bhutto cabinet was photographed decked in Mao coats. 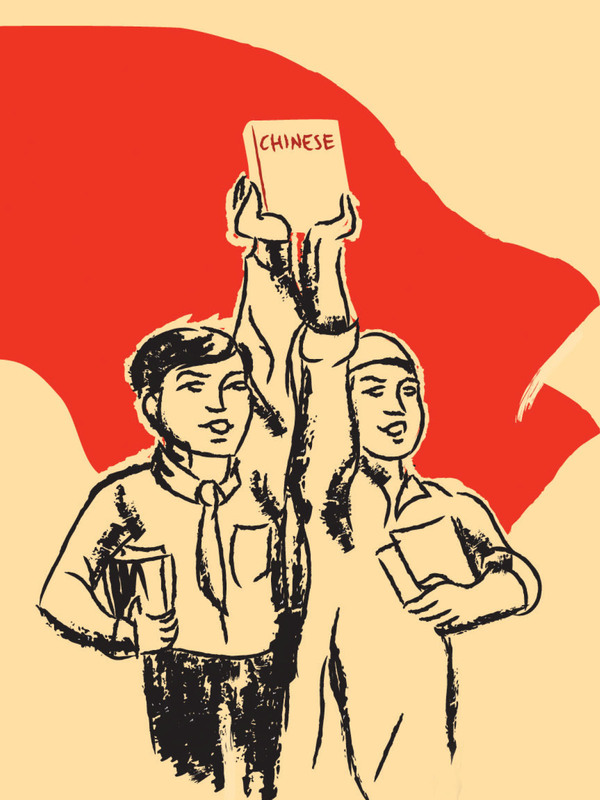 It was also during the 1970s that the Chinese government started Urdu-language classes in various universities in China and the two countries initiated exchange programmes for writers, students, journalists and political activists. The generation that grew up in that decade still remembers Cheen ba Tasveer (Pictorial China), a Chinese propaganda monthly which was then an integral part of book collections in almost every middle-class household in Pakistan. “Bhutto injected Chinese culture into Pakistani politics. He would talk at length about Mao in his public speeches,” says Sayed, who first visited China as a 17-year-old student in 1971. China-inspired political symbols started fading away and people-to-people exchanges became less frequent after General Ziaul Haq toppled Bhutto’s government in 1977. Ahmed, however, points out that those developments were not sustainable for the long run in any case. “The two countries failed to boost people-to-people interaction and build up strong cultural connections because the two societies had never had a common cultural reference point.” Except, of course, the long-forgotten Buddhist connections mentioned by Sayed, which have no contemporary echoes in a mostly atheist Chinese society and staunchly Islamic milieu of Pakistan. Language barrier separates the two countries and there is little history of people from our part of the world migrating in large numbers to China, or vice versa, says Ahmed. “Our traditional migration routes have taken our people to Africa, Europe, America and, in recent decades, to the Middle East but never to China.” Little wonder then that China’s cultural footprint in Pakistan remains limited to occasional sharing of radio broadcasts, a few language training facilities, massage parlours in major cities and myriad restaurants with Chinese-sounding names, red lanterns and chopsticks where desi-styled wonton soups and spicy chow mein pass off as authentic Chinese cuisine. Masood Khan, who has also served as Pakistan’s ambassador to Beijing recently, believes that the two countries are working hard to overcome the barriers hampering cultural linkages and people-to-people exchanges. “Language has been a barrier but this is being removed now,” he tells the Herald. The number of students going to China for studies has increased over the last few years and exchange programmes for journalists, academia and artists have also been revived, he adds. 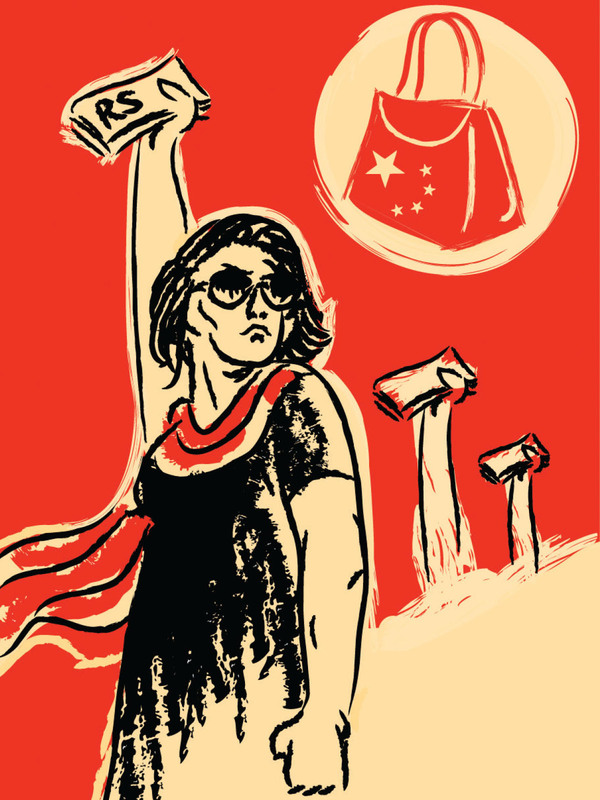 According to PCI-collected data, more Pakistanis are studying in China than they are in the US. “The number of Pakistani students studying medicine, engineering and other subjects in China has gone up to about 10,000; this is higher than the number of Pakistani students in the US,” says PCI’s executive director Mustafa Haider Sayed. “Similarly, more Chinese are travelling to Pakistan for work, studies and tourism than they ever did in the past. At the International Islamic University Islamabad alone, there are now 200 to 300 Chinese students,” he tells the Herald. Yet, as diplomat Khan acknowledges, the two sides “need to work more vigorously in the area of people-to-people contacts” if the extent of their diplomatic, political, economic and military relations is to be reflected in how people in the two countries view, and treat, each other. Mohammad Arif, the Beijing-based editor of Nihao-Salam, a bilingual e-magazine that promotes cultural interaction between Pakistan and China, blames Pakistani authorities for slow progress on people-to-people contacts. This, he says, is due to excessive focus among Pakistani policymakers on military and political relations. “All the programmes in recent years to promote cultural interaction between the two sides were initiated by China,” he says. If there were three things that all Pakistanis could agree on, Senator Sayed would list them as nuclear programme, Kashmir and friendship with China. The consensus on them cuts across political and party divides, he claims. And they are interrelated. Pakistan’s search for nuclear weapons and its desire to have a strong military owe their existence to a perpetual conflict with India mainly, though by no means entirely, over Kashmir; and China has been an active facilitator and sponsor for both advancing and materialising Pakistan’s nuclear and conventional military ambitions, providing it hardware no other country was willing to give it. Between 1966 and 1980, China provided military equipment to Pakistan without charging any money for that, says Sayed. China has also helped Pakistan set up the Heavy Industries Complex in Taxila. It was initially meant for the repair and maintenance of Chinese-provided al-Khalid tanks in early 1980s but has been upgraded to a massive armament manufacturing industry. In a similar way, Pakistan Aeronautical Complex in Kamra has become another success story of growing Pak-China cooperation in the military sector: JF-17 Thunder, a fighter plane, is a joint Pak-China production to have come out of that complex. In one of the most internationally embarrassing terror attacks in Pakistan, three Chinese tourists, and many other foreigners, were killed by unknown gunmen dressed as officials of a paramilitary force near Nanga Parbat peak in the Himalayas in June 2013. Over the years, military cooperation between the two countries has only intensified. The Stockholm International Peace Research Institute says China has now become Pakistan’s largest arms supplier. Nearly 47 per cent of all Chinese international arms sales come to Pakistan. The two countries have also collaborated closely on nuclear technology — both for military and civilian purposes, according to Small. “The peak of nuclear cooperation between the two sides was in the early 1980s, for the development of the bomb, and in the late 1980s and early 1990s, for the development of missiles and missile technology,” he says. “On the civil nuclear side, China, of course, is the only country willing to press ahead with [setting up] nuclear power plants [in Pakistan] despite restrictions in the Nuclear Suppliers Group.” Beijing has already provided Islamabad two nuclear power plants, operating at Chashma, in Mianwali district; plans for setting up more joint Pak-China nuclear power plants in Chashma as well as Karachi are well underway. The growth in bilateral strategic relations has given Beijing a salient – though silent – leverage over Pakistan’s military and political leadership that no other country – except Saudi Arabia — has had in the last three decades. “Unlike our Western allies, the Chinese work rather quietly and Islamabad seldom disappoints them,” a Lahore-based analyst, who refuses to give his name, argues. Some Pakistani analysts insist that America has used this Chinese leverage to defuse Islamabad’s tensions both with Kabul and New Delhi in the recent past. “Beijing is actively involved in helping Kabul and Islamabad to work together against terrorists for stability in the region,” says the analyst. Others say it was under China’s pressure that General Pervez Musharraf pushed ahead with a military operation on Lal Masjid in 2007 after students from its associated seminaries raided a beauty parlour and took the Chinese women running it as hostage. Senator Sayed believes China may have Pakistan’s ear but it does not possess and exercise any leverage in Islamabad. “At crucial moments China has only offered sincere and frank counsel to Islamabad. 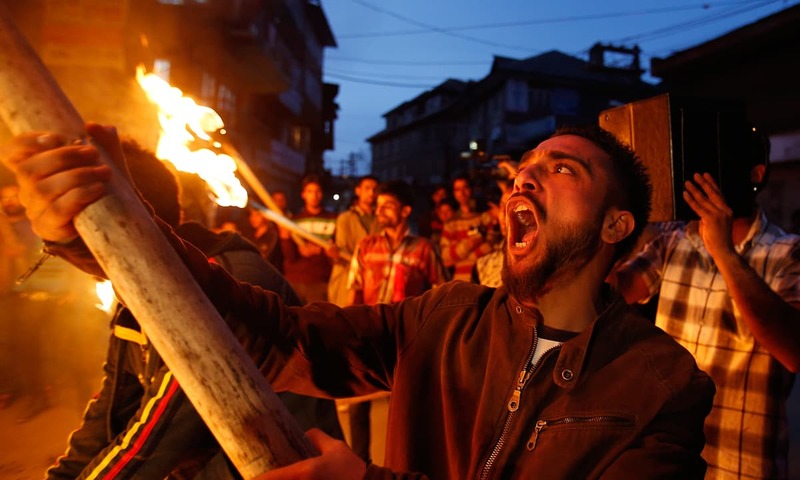 For example, it advised us in 1971 not to alienate an entire populace through military action and in 1999 urged a withdrawal from Kargil,” he says. “China also wants Pakistan to focus on economy and development, and defuse tensions [with India] without giving up its position on the contentious issues,” he adds. Even if China is not as intrusive as some other global powers are when it comes to dealing with Pakistan, there are serious concerns that Chinese authorities would have their Pakistani counterparts address urgently and effectively. For one, China cannot remain oblivious to the threats that it faces from non-state actors operating from Pakistani territory and those threats could be the reason why it is willing to invest in strengthening and stabilising Pakistan’s economy. Chinese expatriates working in Pakistan on important China-sponsored projects, especially those in the restive parts of Khyber Pakhtunkhwa, tribal areas and Balochistan, have suffered many serious attacks over the last decade or so. There were incidents of abductions of Chinese engineers as well as instances of the murder of Chinese workers in Pakistan. In one of the most internationally embarrassing terror attacks in Pakistan, three Chinese tourists, and many other foreigners, were killed by unknown gunmen dressed as officials of a paramilitary force near Nanga Parbat peak in the Himalayas in June 2013. “From a security and stability perspective, Pakistan is one of China’s greatest concerns too. The long-term trends of rising extremism in the region worry Beijing, and it sees support to Pakistan’s economy as one of the principal ways to mitigate those risks,” says Small. He also links this to the Chinese view that stabilising China’s entire western periphery – which includes Pakistan, Afghanistan and the Central Asian states – and pushing an economic development agenda in the region will ultimately prove beneficial for its own troubled region of Xinjiang. “In practice, it is far from clear if throwing money at the problem will solve it but for the most part [development projects such as CPEC are] not being undertaken just for the transactional benefits of gaining additional leverage over neighbours,” explains Small. If the Chinese do not exercise any leverage over Pakistan, as Small argues, then why do Pakistani military and political leaders pay visits to their Chinese counterparts as soon as Pakistan is faced with some internal or external crisis? 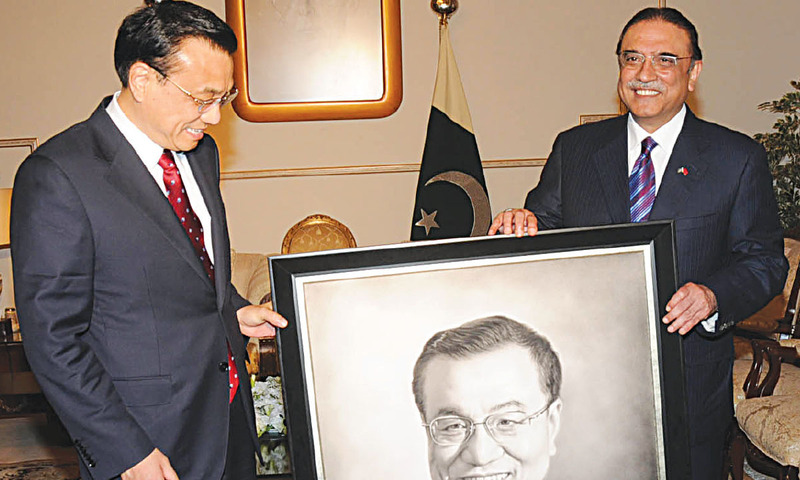 Between 2008 and 2013, Asif Ali Zardari visited China at least once every year during his tenure as president — in some years even more than once. Prime Minister Nawaz Sharif and his brother Punjab Chief Minister Shahbaz Sharif have also travelled to China multiple times over the last two years. So have army chiefs and other senior military officials. Whenever Islamabad comes under pressure from India or the US over issues such as Kashmir, cross-border terrorism or nuclear technology, one of the most sought after ploy by both civilian and military high command in Pakistan is to rush to Beijing and try to get the Chinese issue a statement that, directly or indirectly, favours Pakistan’s position. Does that suggest that policymakers in Islamabad are completely beholden to China? The answer would be a resounding yes if one were to look at the media debate that such high-level interactions between Pakistan and China have always generated. The initiators and most participants of this debate present China as a one-window solution to all problems that Pakistan has — from tensions with India and Afghanistan to confrontation with the US and from economic and industrial development to energy self-sufficiency. Spurred on by the high-pitched official spin that China will always go out of its way to support Pakistan, pro-China and anti-West columnists, news analysts and opinion writers take to describing the unlimited benefits of being friends with China with such gusto that it becomes easy to believe for all and sundry that China will take care of any trouble that Pakistan has ever had, or will ever have. Xinjiang is an autonomous region within China. Spread over a vast area – one-sixth of China’s total land mass – that borders Pakistan in the south, Afghanistan in the west and central Asian states in the north-west, this region also produces almost 40 per cent of China’s oil, gas and coal. Its geographical location in western China makes it ill-placed to benefit from the phenomenal Chinese economic boom over the last two and half decades as much as the eastern Chinese regions and cities have. It is around 4,000 kilometres away from the China’s business ports and trading hubs in boomtowns such as Shanghai, Shenzhen and Guangzhou. The other distinctive feature of Xinjiang is that it is the only Muslim-majority province in China and its Uighur natives, being of Turkic origin, are ethnically different from the Han Chinese who dominate the rest of China. Beijing’s official strategy to overcome Xinjiang’s isolation and backwardness has rested on two prongs — to build communication infrastructure in the region to link it with the rest of China and encourage Han Chinese to move to Xinjiang to set up factories and other businesses. This, however, has led many Uighur Muslims to believe that China wants to eliminate their religion-inspired culture and turn them into a minority by changing the demographic balance in Xinjiang. Building on these sentiments, a small but violent separatist movement, organised under an armed Islamic militant group, East Turkestan Islamic Movement (ETIM), has been going on in the region since the end of anti-Soviet jihad in Afghanistan in 1989. Militants affiliated with ETIM are seen by the Chinese authorities as responsible for a spate of recent terror attacks both within Xinjiang and elsewhere in China. The most deadly of these attacks took place in Xinjiang’s capital, Urumqi, in 2009. It left 200 people dead and over 1,700 others injured. Chinese presence in Pakistani political culture reached its zenith in the 1970s. Mao caps and Mao coats that Bhutto appropriated became the political and fashion statements of the day. Officials and analysts in China believe that ETIM activists are trained in and operate from Pakistan’s tribal areas. Many of these militants, indeed, have died in Pakistani territories over the years in American drone attacks or in operations conducted by the Pakistani security forces. Beijing has long been putting pressure on Islamabad to uproot ETIM training camps and activists based in the tribal territories. Unsurprisingly, Pakistan has always responded positively to these demands, killing or capturing a number of ETIM leaders and extraditing the captured ones to China. This was originally published in Herald's August 2015 issue. To read more subscribe to the Herald in print. The writer is a chief reporter at the daily Dawn in Lahore. All illustrations by Sana Nasir. If Pakistan is not careful, the country could soon be drowning in Chinese red, killing the local industry all together. Unintended consequences of Free Trade. IN this case it is entirely one-way trade. relationship with china like using a china product. no warranty or no guarantee. Long article , but in short only if average Pakistani worth of anything we don't jumpimg for foreign help. Pakistan have resources system somewhat leadership but average Pakistani is indulge in religion race and full sectarianism. Pakistani people are not nation builder and lack common sense and you see this conduct everyday. Pakistani market is flooded with Chinese goods. Pakistan will very soon convert into consumer market. All the factories/industries will be closed down. The agriculture will also be destroyed . Here inputs like electricity, gas ,etc are very expensive as compared to China. So made in Pakistan can not compete with Chinese goods. As a result unemployment in Pakistan will rise . It is very dangerous and critical moment for our country. There is need to place some check on Chinese goods to avoid the total collapse of our industry. Every foreign product sold in the country takes away a handful of jobs from the locals. When it is low and consumer goods, the worst to get hit is the mass employment labour intensive cottage and small scale industry. Chinese cheaper goods, sometimes sale price being lower than the raw material cost are highly subsidized MSME products of China ensuring mass employment possibilities there. Chine also produces high end quality products. But they are for the west where buyers can pay and will pay. Sad- our poor economies are getting squeezed by the Chinese dragon and we can hardly do anything about it! Nothing to celebrate, please. China has to support a population of plus 135 million. And that it would do- friends and foes be damned! An interesting overview of the current influence of China thru consumable. In a way it is good. Even in the west most "fake brand" goods are sold in major stores. That is what an middle-income Americans can afford. Middle and low income Pakistanis are in the same league as average Americans. Enjoy life at low cost. chinese will bring discipline in economics to pakistan. More power to China!! How have ‘Made in China’ products become so easily available all over Pakistan and at prices that almost everyone can afford? 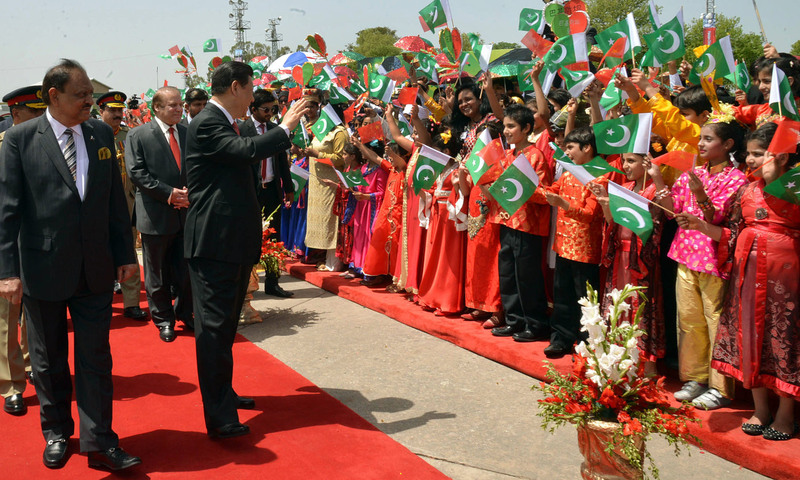 The answers lie in a free trade agreement between China and Pakistan. The answer is wrong. USA don't have free trade agreement with China. The answer lies in China's ability to produce at a competitive cost. CPEC is more like Chinese Power Extension Cord to Gwader, its lease-owned territory, through the middle of Pakistan. We create our own aircrafts. The same is the case in the West. Their markets are flooded with Chinese goods, even the big super stores are also stuffed with it. Pakistan needs a revolution, if not anything else then be it Chinese. @shaqus Yes more power to China and lets begin by letting them formulate our Budget as our politicians are no good. All wonderful but is anyone thinking about the Pakistani industry. Soon everybody will have to down shutters if this flood continues. @tariq "Long Live China Pak Dostee" - Another version of "Hindi Chini Bhai Bhai"
Wait for another version of 1962, that broke idealist Nehru's heart and he died of it. Briefly, Pakistan is speedily moving as colonial state of China after its independence from British empire. The widening gap in export & import with China would be suicidal for your economy & would kill employment generating opportunities of fast growing populous Pakistan as your own increasing internal consumer demand would be met with neighbor dumping products at low cost. Is it good to have such a penetrating influence of a great power in Pakistan or not? Would that make us more dependent or just happy? Buyers, Sellers, Makers are all winners so what's the problem? Pakistan is in the early stages of being Re-Colonized. Remember how the British came? As Traders & not just any traders, they enjoyed the Monopoly. They won this monopoly by bribing the corrupt Princes, who were busy fighting each other and did not pay much attention to what it meant. Before you know it, Pakistan will be totally dependent on China and resentment will than start to set in. Especially given the Chinese state policy of repressing Islam (Everone in Pakistan knows it but some how doesn't mind it). Consider it a friendly advise: Establish peace with India and keep a balance between China and your other friends. After the CPEC completion the trade will grow tremendously though it is still growing at a very fast pace. And the best thing is that the partnership is not all about trade and commerce, and setting up of industries, the strategic military partnership is even more important. Very enjoyable article, but lacked depth and critical analysis. There is no doubt in many respects China relationship has been good for us, in terms of political and military support, maybe that's enough. Economically it is a disaster. Parliamentary committee says we are being charged 8% interest., but there are no public facts to scrutinise. The only other benchmark is electricity prices, Bawalpur solar plant is double the price India pays, twice what UAE pays, but these are under CPEC , the theory being soft loans but no competitive International bidding and in solar the cost of capital is the key. Our debts are rising, and our population is due to hit 300 million in 2050, 34 years time. On a side note, Indonesia our Muslim brother in arms, used to give 100 countries , including India, visa free access , this month they added another 69 countries, including Nepal and Bangladesh, but not us. @Kepler Sir, China is India's neighbour since 5000 years and still it is not a friend of India. Same is true with Japan and Korea. China and friendship are opposite words in international relations. Soon our streets will be named after Mao, Tao etc. @shaqus Sir, 95% of the consumer goods come through gray channels evading tax and duties, A direct loss to our economy. Please do research before telling one side. @Prasad Read the article in detail, Pakistan produces almost every household electric, electronic, LSM, SME products which is conceivable. And if China is setting up manufacturing plants it is good for the economy. You know nothing about the manufacturing sector in Pakistan. Instead we better merge Pakistan with China. Pakistan is a very small market for China and China is a very big market for Pakistan. If Pakistanis play their cards right there is so much to gain here. As for the comments by Indians on the forum, bitter as usual! i m surprised to see that the writer is a chief reporter. @woz ahmed "Indonesia our Muslim brother in arms, used to give 100 countries , including India, visa free access , this month they added another 69 countries, including Nepal and Bangladesh, but not us." This is exactly why Pakistan has no choice but be friends with China. Irony is, Pakistan doesn't just see it. If 100 people are saying there is something is wrong with you, you better believe it and start to fix it as opposed to criticizing everyone. @Nazir Ahmed Provided China is interested. If you are submissive to master then you can survive. The same feudal approach in China-Pak relationship. People have a right to disagree but I see Pakistani citizens loosing a lot more than Chinese citizens in this relationship of "equals". We just need a good leader to lead us. we are lucky that one of our neighbour is turning fast as super power. More importantly we are close to China in term of business and other things. So the situation is win win for Pakistan. Long live pak china cooperation. I am not using the word of friendship because it has no place in the dipolmatic world as only self interest bring two countries close. we should adopt this word if we want to progress. Pretty soon the most of the local industry would be dead. We will become just another consumer country. No industrial growth or jobs created but just wholesale/retail consumer level activities. Doesn't contribute much to boosting the national GDP or other economic indicators. Pak-Cheen dosti Zindabad! Pakistan's bright and progressive future lies in total economic,cultural,political integration with China. This shall weaken the Pakistani industry and lots of things that Pakistan, in future, could have developed. Too much dependence or use of foreign things, technology and assetss may hurt your own capabilities. Soon many Chinese industries will be shifting to Pakistan to get benefit of cheap labour here, Pakistan will become next China. @Rafi Ka Deewana The worry is that Pakistan may become another North Korea under Chinese hegemony. What a fantastic article. China-Pakistan friendship has proven itself against all odds. China is a nation we can trust to take care of Pakistan's interests. If manufacturing goods is more efficient in China, we should move our manufacturing base to China while Pakistan can focus on enjoying the enormous natural beauty of Pakistan. We could develop a tremendous touring business and become fully protected by our great friend China. A big one, but a most rewarding one, economy and politics as well as culture and military. Many thanks to the author, and a suggestion to a prospective reader that if one is patient, one will be amply rewarded !!! All this means is Pakistani Forex going away. Which direction is the trade surplus between the two countries? @Zak Good leader also comes from good society of thinkers. A country becomes good because of good pool of visionary thinkers/leaders, scientists, entrepreneur, artists/writers. On top of it good value system. @lafanga: " Pakistan will become next China." Many of us will agree, but without the word "next". Pakistani map in 2nd picture is incomplete. Kashmir side is missing. Pakistan should merge itself with China. Why this drama of being two countries? @Prasad You don't need to have a manufacturing industrial base to become affluent. It is service sector that is all the more important for economy. Th retailers and service providers ( for example to sell TV sets and who offer services to them) make more money than the one who manufactures the TV sets. In most developed countries service sector is almost 70% + of the economy. In America it is 78% service sector 20% manufacturing and 2 % agriculture. Take any affluent cities like say Dubai or Mumbai. Dubai has no oil resources and no manufacturing. But it is the richest place in whole of gulf. It is because of growth in service sector. The whole world is enjoying cheap chinese goods not just Pakistan. Next door India may have gone to war with China at one point but today their bilateral trade is in the tens of billions of dollars per annum and it is heavily in China's favour. China has won everyone over through trade! @Pak "As for the comments by Indians on the forum, bitter as usual!" Yes, it is a bitter reality that some nations just love to be used by bigger powers, just due to a million hatreds and suspicions. First, it was the USA and Saudis, now it is China. Had India really harbored ill intentions towards Pakistan - there would be no Indus water treaty or water coming into Pakistan, 93K POWs would have been massacred, given Indian army size after seventies they would have entered and broken into pieces before any nuclear capability arose, and even now given befitting responses to so many terror provocations inside India and would have made at least Balochistan a separate nation by now. You want to see the Chinese in action,just go to any City outside China that has a lot of Chinese Expatriates. The Locals Hate them,they bring Filth,Fake merchandise,try to sell you Garbage and you thought the Pakistani Business men had a Bad reputation? wait till you deal with the Chinese,NOT GOOD! This not a Pakistan particular issue, it's all over the world; here in the UK as well. Don't try to twist things, China is a market leader, period. By the way Japanese and American companies all make TV and other electronics in China. So Pakistan will be left with only farmers and traders ! Just like it was centuries back. Pakistan may soon need to levy anti-dumping duty on chinese imports or else risk becoming a chinese colony. But this can only be an interim measure. What needs to resolved is the question of how is it that chinese input costs (salary, electricity etc) are growing whereas the cost of the goods produced are coming down. Once the reasons are known, only then Pakistan industry can think of competing with the chinese imports. Whatever reasons we give, the big picture is that CPEC will enhance the economy. Only factor we need is that government is sincere in uplifting the economy. Long LIve Pakistan/ China Friendship. It is economic and physical occupation of Pakistan by stealth. Pakistan will become extension of Tibet with no control on the future of country as govt. policies will be dicatated from Beijing. It is worse then US occupation. Very well researched article, informative with in-depth facts. Appreciate writers efforts. @Changez_Khan Chinese are happy,consumers are happy. But it is going to make it impossible for local manufacturers to stay in business.That is a BIG problem. We need the Chinese to invest in manufacturing in Pakistan. The retail sector is obviously happy thanks to cheap Chinese goods but this is not going to turn us into a developed country. For providing port facilities and access to the Indian Ocean, China should reciprocate by investing in industry. Chinese good equals more unemployment in Pakistan. Unemployment equals more unrest in country, Which brings More terrorism in country which is already Infested with terrorists. Beware Pakistan and its people. @Mazhar Khan Good idea but china has never done that. Plus Pak lacks basic infrastructure to support manufacturing. For starters, quality modern scientific education. @asad lateef Assad, if India makes a mistake the does it means Pakistan should follow suit. It is much better to learn the mistakes of others and not to repeat it. @Aimal probably, but when combined China and Pakistan will have largest arsenal of nuclear weapons. Add those nuclear weapons to North Koreas and now you all will be talking "nuclear" language more than ever. Only the consumers are the losers. The conclusion of this article is that, mass influx of Chinese goods into Pakistani market will eventually swallow local businesses and it is a very bad indicator for economical growth. Govt should protect our industries, otherwise we will keep on receiving rejected or excess stock destined for West, ends up in Rawalpindi or Lahore markets. The whole article seems to be advert paid by the Chinese. It is important to remember China under Xi is not the same as it was under Deng. While Deng focused on economic development, Xi's focus is on power consolidation both internally and externally. For example, China making islands and airbases in South China sea has nothing to do with trade but power grab and showing its power to the annoyance of Vietnam, Philippines and Japan. Those kind of imperialistic claims despite being a signatory to the UN treaties does not bode well for peace. Pakistan blindly supporting China's policies and ambitions runs several risks. The development of economic corridor is also aimed at India's eastern markets. FTA agrrement means both parties can export to each other without restrictions. There are lots of people here issueing warnings about Chinese imports and whining and complaining. However, think about it because China is not only exporting but also providing a market of more than 1 billion consumers to Pakistani traders. If they can not take advantage of this market, they will never ever succeed anywhere else in the world. Paksitanis should be gratefull for this opportunity. Only loosers compalin and are afraid of challanges. Just look at India next door and they are doing well trading both ways with China. Need not say more. @lafanga even for CPEC road construction, they are paying Chinese workers a risk premium and bringing them in instead of hiring local Pakistani workers. All you will have left is burger flippers, dish washers and truck drivers in pakistan after china kills all manufacturing. Two alarming observations in this article. A chinese man selling jewellery in pakistan. Why should that happen? If you allow others to sell goods in your country, atlease make sure your people benefit from it. The point you make is well within reason when it comes to Pakistan. However, It becomes off reason when we find India being an enemy of just about all of its neighbors, not to mention a few other angered and aggrieved minorities within India which contemplated independence like Pakistan, but decided against it. Its about time that India give a thorough review to its foreign policy. Its needs friendly relations with its neighbors and not so much with neighbors of its neighbors. This is big article but the idea is clear , domestic production will dwindle if Chinese goods move unimpeded , this applies to many countries not only to Pakistan.Chinese have been better traders since dawn of human civilizations and are a world wide phenomena , well organizer and sincere also so this is a potent combination , cheap goods and a good trader . @Zak Kashmir zak?..wont that fix this china issue? Lets not be overly concerned about it. Chinese products are impacting the world over, not just Pakistan and such trade is irrelevant to other friendly or unfriendly ties between the countries, For example, Chinese products are affecting a lot more (in comparison to Pakistan) the similar products being produced by India. We, today live in a competitive & shrunken world; every day there are winners & losers all over the world. Critics sound like paid crowd chanting Isolate Pakistan to death. USA Pakistan relation is souring day by day, India was never a friend, Afghanistan is strengthening, only friendly strong country is China; which is going to dictate what suits it's economy and itself. Although Pakistan virtually has no choice other than to follow China, but still it should try to stick to basics of strengthening it's local industry, a friendly message from presumed non-friendly country. Good luck. A very detailed article given all the dimensions involved. All this is certainly good for the Chinese but whether it will be good for Pakistan or for that matter India and other consumers of cheap chinese products overall after some years is something only economists can predict. As can be seen from the article old pakistani factories are closing and workers are losing jobs but new retail jobs are being created. No country can just remain a consumer and has to strive to export back too. This is very challenging when it comes to China because they have had so many advantages over the years (and have worked hard at it) but rising wages in china will hopefully force them to move manufacturing to other countries. ZAK : "Pakistan's bright and progressive future lies in total economic,cultural,political integration with China." Cultural? Chinese culture involves eating a lot of pork too. What is the trade balance between Pak and China? most insanse article ever,. nobody promotes foriegn goods and glorify .. especially at the cost of your own industry. China will do to Pakistan what they did to Tibet, only in more subtle ways. Pakistan is going to be trade hub for China to approach far bigger markets through CPEC, things will automatically get aligned by the passage of time. We need to focus on Agriculture, Textile, IT and other segments where we may compete in the global market. What technology transfer is taking place? What research in science is being shared? What is the level of security agreement? What are the concessions that China has asked? The Chinese will make money from Pakistan. Their big infrastructure projects are implemented by Chinese industries only. The selection is not through bidding process. The power generated by the Chinese solar panels are sold at very high price almost double the price that is generated in India through solar panels. These amount is to be paid to Chinese companies in Dollars. Nothing is coming cheap. Pakistan should look for manufacturing locally and also opening up trade with India which will be mutually beneficial. Otherwise tough days are ahead. 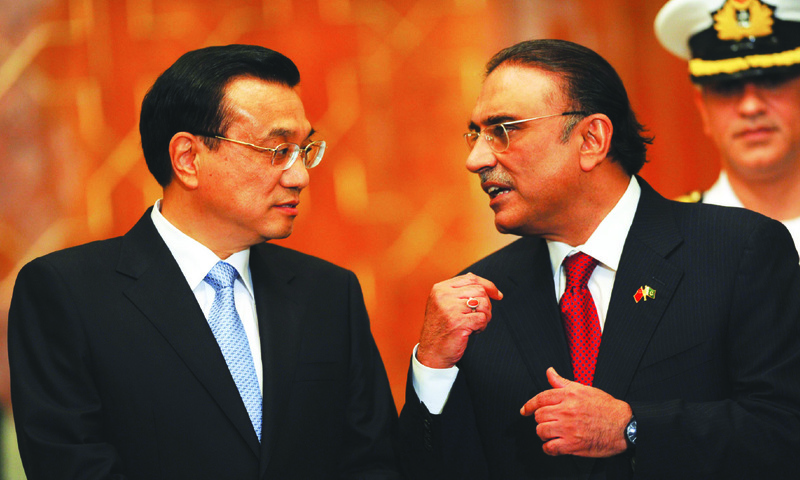 Where were the chinese when Zardari went to Beijing asking for a 500 Mn US loan? Most of these misty eyed romaticism is from Pakistanis. The Chinese are very clear headed and know what they want - A vassal Pakistani state. In this article Cartoons speaks louder than the story, Particularly the "fragile Red Pakistan which is made in china" superb thoughts . Yes, we have seen what happened to US economy after the reliance on low cost Chinese products. 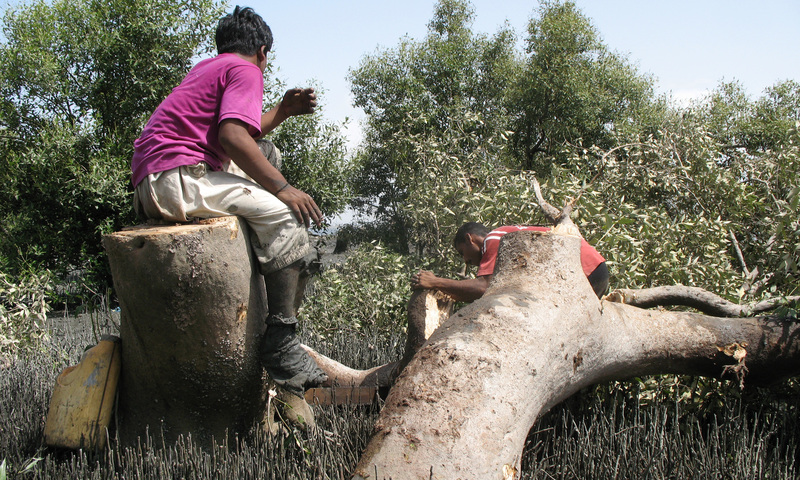 But equally worrisome is the impact on health of people and our ecosystem. Every now and then there are scary reports of contaminated or hazardous products from China, including baby milk. It is not just the life of the product or its sturdiness, but if it poses any health hazards. At least the Govt. departments should test products before allowing selling in the market. Just to put aside the worries that Pakistan is becoming extremely dependent on China; look at the other side of the picture, China will be getting dependent on Pakistan for routing its products to middle east and most of Europe through Gwadar. Secondly, if China does not behave as a good friend, America would be more than willing to take Pakistan into its lap as a means of encircling China, after all ETIM would be much more furious if it had support by Pakistan. I think the situation is moving towards a balance. You say, chinese goods are cheap and people are able to afford them. This is only one side of the story. People need money to afford anything. If Chinese goods flood our markets , it means local companies will close down. This means loss of jobs for the local people. Pakistan people are mostly illiterate and therefor do low skill jobs. If Chinese take these jobs, do you think these people will be able to take high skill jobs where there aren't any ? This will lead to civil unrest in a few years time. People will not have the money to afford anything since they will not have any jobs. China soon overriding all of Pakistan. The article has a pessimist overtone. We are already encircled by our part imagined part real enemies (Afghanistan, Iran, India), we fear and desist West. China is the our only hope ushering us to today's globalized world where protectionism and isolationism are getting obsolete. If we can't learn to compete and live with Chinese then it would be very hard for us to live in a world where processes of production, distribution and consumptions are disperse globally across countries each promoting area where it has an edge. Interaction is must even if it is costly and painful at the beginning. The initial imbalance with China is compensated by its huge investment and eagerness for sharing production and technology. However, instead of putting all egss in one basket we need to open up to our other neighbors too in the same manner as to China. @woz ahmed I know.I visited Indonesia in March 2016. No hassles, just showed my Indian passport and got Visa on Arrival. This begs the question....what have you guys been doing lately, to have such a negative image the world over? @Mazhar Khan That they would not do ever. They don't want to weaken their own manufacturing sector! Chines and Pakistanis are not look alike but Yes, Indian and Pakistanis are look alike. Britishers came in guise of traders and later was able to rule whole of India. lots of things to learn from out past. Instead of depending on China or US, India-Pakistan should help each other. @Changez_Khan : Do you know why British colony denuded local communities and made them poor ? Do you know why we all had to fight for freedom to break the shackles of this viscious grip on the economy which was run for the benefit of colonial masters ? That is what is wrong with this arrangement. Very soon Pakistan will find they have replaced British yoke by Chinese yoke. For Pakistanis nothing has changed. It is good that good but inexpensive goods are coming into Pakistan now. Just like that person who changed his business model to ensure that no Chinese products in gardening come in, in the same way all businesses which want to exist would have to become competetive. Which in turn raises the efficiency of the producing economy. If nothing else happens, atleast the Pakistani's would be free from the humdrum of manufacturing and can go back to leading their pious religious lives. The story is the same everywhere - whenever a country signs FTA with China, it spells deathknell for its domestic manufacturing. Only way to survive is to compete with them. But when China manipulates its currency, or subsidises their manufacturing, there is very little these countries can do. China is trying to move away from a manufacturing/export based economy to a consumption based economy. So far at least that transition has been unsuccessful. I was interested in some constructive user comments on this and it appears that only a fraction of people commenting actually read the whole article; tells a lot about internet experts ever ready to blast about anything and everything from basic trade to complex international relations. Anyway, the subject has been masterfully captured by author. Highly researched, very balanced and an interesting read. Relationship between two states can never be a bed of roses or thorns. There are no "brothers" at international levels. Same is true about Pakistan-China. This is what a well researched, comprehensive article looks like. Kudos to the author for analysin gthe Pak China relationsp from all aspecgts. China is the manufacturing capital of the world, which includes USA, Europe / United Kingdom, Canada, Australia and New Zealand..... China offers merchandise (branded) withgreat affordability to the Mass population of all above mentioned countries who are looking for quality products with high margin, which equates to higher profitability, leads to higher tax revenue and ultimately a higher Stock market. If China doesn't buy raw material from the above mentioned countries their economies fall in recession, due to decline in export dollars and decline in tax revenue. So Pakistan should eliminate corruption, increase tax revenue to fund Education, Health and Justice and we too will prosper just like the Western countries. @Jitendra .the indian govt officially opposed cpek.our indian friends who are writing these comments are so worried about Pakistan being colonized.with such good neighbour why do we need china? This example is truly a summary of how Pakistan became a Chinese colony. Pakistan like Xinjiang will soon be renamed as 'Pakistan Autonomous Region of China'. @asad lateef Every country has trade imbalance with them but that does not mean Indian MSME were destroyed, in fact it stopped price gouging by Indian Manufacturers and they started competing with better quality products to Chinese C/D class products and they won fair and square.. but in Pakistan you don't have those industries to compete with them... Bulk of what we import today is LCD screens and with manufacturing units coming up here in India itself those imports would go down. I think china though a friend , still it's looking forward to stabilize it's over exploding population . My innocent Pakistani brothers think from where the money to buy those Chinese stuff will come? As it is now you only have agriculture to sell. Search Haier Ruba Pakistan. This is the difference here, China exports to Pakistan taking the sea route from the Industrial areas is much longer compared to India. I did not mention Pakistan produces 2 million motorcycles last year and there is a robust tractor, trucks, small trucks, buses like Hino, Isuzu, and car assembly is there. China is only using Pakistan to their advantage. There is very little in common between Pakistan and China - culturally or otherwise. Muslims have absolutely no freedom in China.. in fact the Chinese treat their Muslims worse than even slaves! Indian Muslims and Kashmiris have far more rights than any Muslim in China. I sincerely believe that it would be better for Pakistan and India to work together and forge a strong bond in trade and otherwise. Culturally, we are one and trade between the two would be much more beneficial to both nations. Government should remove taxes on utilities for businesses and that will make local industries competitive. All over the World utilities are cheaper for businesses. @oldman for a instance we consider that Pakistani population as you are saying become a consumer market for Low grade cheap Chinese goods and due to which local industries will not compete the Chinese manufacture and eventually local industry dies leading to unemployment at large. and resulting in Civil Unrest. what do u think after investing Billions of $ on CPEC are they looking for a market for selling there goods where people have no money to buy goods they are selling. I dont think Chinese are stupid, CPEC only thrive if Chinese and Pakistani Economy grows simultaneously. China is going to establish manufacturing units just like Hairs in Pakistan which results in more employment and results in increased per capita income which mean increased consumer spending resulting in PROFITABLE CPEC INVESTMENT. If Pakistan is not careful you run the risk of becoming a "Vassal" state like "Korea". That is how the Chinese have dealt with smaller less powerful nations over the centuries. In Geopolitics, there are no permanent friends or enemies. @XoF JF-17 is not your own aircraft.It was designed and developed in China. Pakistan only funded a the cost of its development. Major components used in the aircraft are either Chinese/Russian. Good. Long live Pak China friendship. A mutually beneficial one and big things are coming for both nations to feel happy about in this while whole world may not have same feelings. @Robert Pakistan has around 120 warheads, China has 240-250 warheads and North Korea has 10-16 warheads. The USA has around 5000 nuclear warheads. And Pakistani warheads are useless against USA since there are no long range missiles(ICBM) in Pakistan. We are the 6th largest country in the world, we need to grow up and stop looking outside for solutions or help. Chinese products are low quality, cheap products, short durable crap which floods the market. They imitate branded products. It will destroy local industries. Toys contain lead and harmful chemicals. Many Chinese milk products and toffees has caused kidney stones due to the mixing of ceramic power in milk power. Chinese always looks for markets to dump their goods. They are friends of no one but themselves. At the end of the day they do business, nothing else. They have less moral values and only show off. China also wanted to expand territory as seen with what they have done with Hongkong and tibet, they make friend with the enemy of their enemies. They have more enemy countries than friends. Allowing Chinese to take over the market would prove disaterous for any nation. A day will come when you will literally realize that China has enslaved you economically, politically, socially, culturally and finally religiously. What is evident is that the FTA with China needs to be reviewed, it does not need to be cancelled rather it should evolve and serve a better purpose for Pakistani industry. These agreements in future need more and better research before implementation. We also in the modern day age of IT be able to tackle under invoicing by checking with foreign vendors that importers are truly reporting purchases. This is not hard to set up, it just takes vision. We Pakistanis also need to keep in mind keep China as a friend, but don't forget your purpose is to serve your own interests before serving China's. Too many Pakistanis seem to think China is friend, without realizing it is doing so for its own interests.